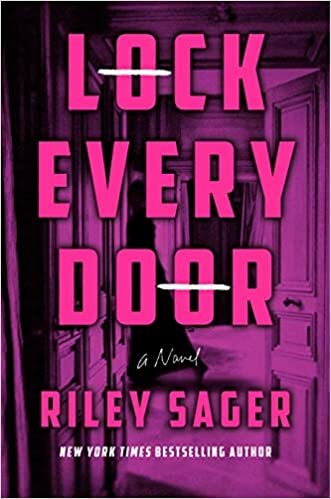 Lock Every Door is about a 20-something woman, Jules, who finds herself in a difficult spot with no job, no family to speak of, and no place to live. She finds an ad on Craigslist looking for an apartment sitter for the Bartholomew, one of the most luxurious apartment buildings in New York City. She goes on the interview and gets the job. One can’t help but think it is because of her circumstances and her single status that gets her this job. It is written in the first-person from a female point of view, which is interesting because it is a male writer. When introduced to Jules, I couldn’t help but think there was something very unfeminine about her and it could be due to the male writer. In fact, the woman showing her the apartment building didn’t seem especially convincing either. There wasn’t much in the way of characterization in the first few chapters and the language seems sort of stilted with lots of fragments. The descriptions and exposition went a little overboard, especially when describing the apartment building. I found myself wanting to know more about Jules and less about the Bartholomew. The book starts in the present day and then goes back in time 6 days before the car accident that Jules wakes up from when she is in the hospital. Jumping from the present to flashbacks definitely adds to the suspense of the story. Although Jules is kind of a generic character, it is written not only in the first person, but also in the present tense, which gives it a sort of every man or every woman feel to it. You really see things from her perspective, which makes certain scenes terrifying. Things get creepier and creepier the more we learn about Jules and the Bartholomew. She meets a fellow apartment sitter named Ingrid who happens to be staying in the unit directly below her. They quickly become friends due to the no visitors allowed rule, but Jules learns that the Ingrid situation is not all it appears to be. Ingrid goes suddenly missing just like Jules’ sister. Jules’ obsession with finding Ingrid borders on unrealistic as she only knew her for a very short amount of time and becomes infatuated with finding her. The author explains this by connecting it with how Jules’ sister Jane disappeared and was never found. I get the motivation, but it’s a stretch. Similarly, the rules of the Bartholomew seem unrealistic as well since she can’t have any visitors, can’t talk to the other residents, and can’t leave overnight. When we finally do find out something about Jules’ past, it seems a little too tragic and too convenient. While the premise may not be totally original or believable, the read is definitely exciting especially towards the last quarter of the book. However, I found myself skimming toward the end, just wanting to get the book done. Sorry to say I can’t say that I’d recommend this one as it is lacking in several areas. The first thing I noticed about Big Little Lies, which was evident right from the start, was the humorous tone of Moriarty’s writing. This book made me laugh out loud quite a few times. The characters’ witty banter and wry thoughts are worth the read alone. Some of the humor comes from self-deprecation and other times the writing just make me identify with the characters as they poke fun at their stage in life or situations in which they find themselves. The book opens with a scene at Pirriwee Public. It’s trivia night and someone has been murdered. Then it goes back in time to retrace exactly how the crime happened. I especially enjoy the police report statements interspersed throughout the narrative, which adds mystery and suspense. It almost gives the feel of a side by side narrative, yet I know that the two stories are not only related but depend on one another for the plot to unfold. Of course, what shines most are the female main characters and their relationships. The story is told in third person limited and we get a glimpse into the lives of Madeline, the happily married “Glitter Girl”, Jane, the single mom with a mysterious past, and Celeste, the mom of twins in an unhappy, abusive relationship. Although leading different lives, these three women come together because their children are all starting kindergarten at Pirriwee Public, a seemingly idyllic school by the beach. Being a teacher myself, I especially like the quite accurate school politics that unfold. The big conflict in the book lies with Jane and her son Ziggy, who has been accused of bullying another student. Jane, being a single, 24 year old, working mom, already sticks out, so this just pushes her farther away from the wealthy families and “Blond Bobs”, as Moriarty calls the PTA moms. What strikes me about the plot is the even balance of seriousness and lightheartedness. Just when I think I’ve had enough of the heavier issues, Moriarty comes in with that trademark humor that I suspect is why the book is such a success. It is lengthy at almost 500 pages and the character threads do go on and on, but I think that’s what gives the book its appeal. You just want to keep reading and reading because you know there’s more to discover. Plus, the big twist on trivia night towards the end is well worth the read. First Comes Love is a story about tragedy and families. Two sisters, Josie and Meredith, couldn’t be more different, yet we follow them through the sudden death of their brother, Daniel, and the aftermath that scars their adult life. The story alternates between Josie’s and Meredith’s point of view each chapter. Giffin’s writing style is easy to read, but in this book, the tone is definitely more sentimental and contemplative. However, the sibling rivalry between the two sisters does bring some humorous moments to the plot. Sometimes, the characters come across as as unlikeable, especially Josie and Meredith when they interact. Although there is definitely unconditional sisterly love, the two obviously get under each other’s skin at times. They often resent one another and feel a crippling responsibility to their parents in the wake of Daniel’s death. As the book progresses, the characters’ complexities become more and more apparent. We find that Josie isn’t exactly the most unethical, unraveled person she initially seemed to be. We also see that Meredith isn’t quite the most straightforward, honorable person she appears to be. What they have in common is that the death of Daniel held both of them back in their lives in one form or another, and they remain both emotionally and psychologically scarred. Yet ironically, this resentment towards one another holds them back from truly letting go and going through the trauma together. The constant theme of fate versus free will comes up often in the book. It makes the characters question all of their choices. If Daniel hadn’t died, would Meredith and Nolan have gotten together? Would their parents have divorced? Would Josie still be single in her late thirties? It’s the constant what ifs that most of us ask ourselves, especially as our life decisions become more and more permanent, that makes this book and its characters so relatable. All in all, I would recommend First Comes Love. It is the first book I’ve read by Emily Giffin and it is clear that she has a talent for character driven novels with deeply emotional story lines. I think it fits squarely in the women’s fiction genre and has just the right dose of reality and sentimentality that keeps me reading. her eyes little crescent moons. He locks eyes with me and I melt. His eyes are blue, but not just any blue. They’re not blue like the sky or a Robin’s egg. No, his eyes are blue like tropical waters off an undiscovered island. I want to dive in stark naked. The cool iris bathes my warm flesh, sharp and refreshing like unexpected rain. I swim laps in the swirls of his variation and drown in the black of his pupil only to be revived again and again to savor the same asphyxiation.